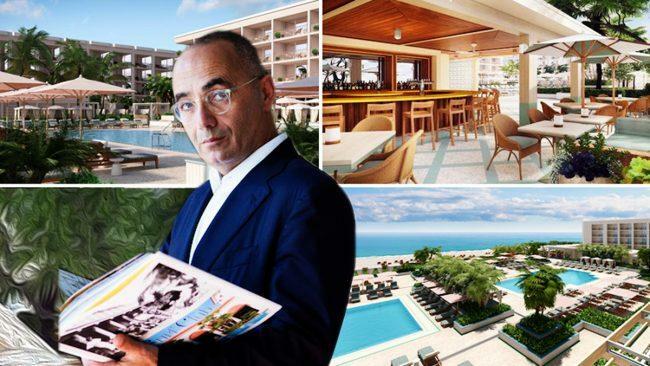 Nadim Ashi’s Fort Partners just scored a $135 million loan for its Four Seasons Resort Palm Beach, amid major renovations set to begin next month. Property records show Acore Capital provided the financing for the 210-room resort at 2800 South Ocean Boulevard. The loan refinances an $80 million mortgage from Sachs FS Limited Partnership and Palm Beach Hotels LTD and adds an additional $55 million in financing. Renovations for the 28-year-old hotel were first approved by the city of Palm Beach about two years ago, but the project has been delayed as plans have been tweaked, according to the Palm Beach Daily News. The renovations were designed by interior designer Martin Brudnizki and architect Leo Daly with landscaping by Fernando Wong. Plans include enhancing the landscaping, re-designing guest rooms, remodeling a pool deck, building an additional adult-only pool and opening a new restaurant with a Michelin-starred chef. The chef has not yet been announced. The Four Seasons will close after the Memorial Day weekend, with construction scheduled to begin in June. The property is slated to reopen this fall. Ashi’s Fort Partners bought the Four Seasons’ previous owner J.V. Associates in 2014 for an undisclosed price. Fort Partners is also in the midst of building a 22-story Four Seasons Hotel and Private Residences Fort Lauderdale. Once complete, the project at 525 North Fort Lauderdale Beach Boulevard will feature 90 condos and 130 guest rooms. The project broke ground on Monday.